Whenever there’s a new arrival, it’s a great time to take a Sunday morning out, get the family and friends round and thank God for the gift of a new life. We also recognise that babies and growing families can be a challenge. 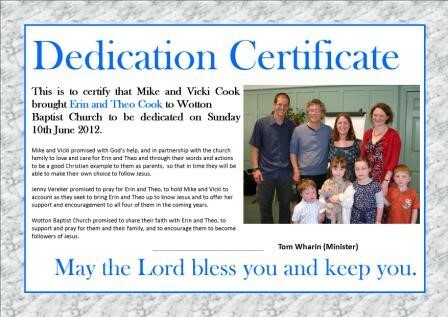 Our dedication services take place in a context of Christian worship (usually a lively all age service). We invite parents and friends to commit themselves to the care of their children, asking for God’s help through all the challenges of parenthood. We also commit ourselves as a church to pray for parents and support them in whatever way we can. Each child gets a certificate, but that’s really just a symbol of our commitment to support families as they commit themselves to do their best for their children.